A rectangular 2 light wall spotlight fitting, with a rectangular wall bracket and matt white fascia decorated with polished chrome detail. Two fully adjustable matt white spotlight heads with contrasting chrome trim complete the design. Supplied with two 9w non-dimmable 9w energy efficient fluorescent lamps. LED GU10 lamps may be used if a higher light output is required. 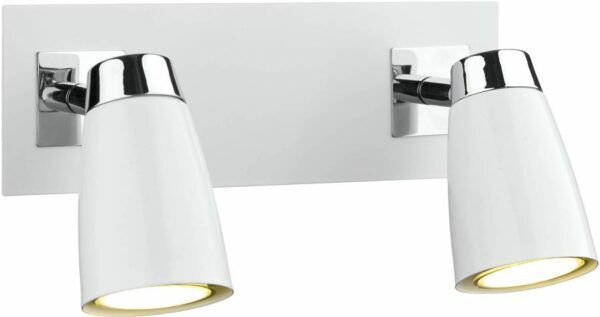 There are matching fittings in the matt white Loft range that can be viewed below and include a four-lamp ceiling spotlight bar and plate and a single switched wall light.